Different applications are possible painting kitchen cabinets, brush, roll, and or spray. Spraying kitchen cabinets is by far the very best, again like having a car finish. Not wanting any brush or roller marks afterwards, spaying your kitchen cabinets is at the top of importance. If you don't have a paint sprayer, or know how to operate one, best hiring a qualified painting company to do this for you. Do you repaint your car when it's needed? Or do you hire it out to a body shop with years of experience? Spraying kitchen cabinets are very similar to that car finish. Painting cabinets with a brush and roller or spray is like having an Earl Scheib or Mercedes-Benz Collision Center. Yes, spray paint cabinets cost substantially more, but you get what you pay for. We, as a painting contractor in the Denver market turn down requests, painting kitchen cabinets using a brush and roller method. Spray paint cabinets are at least a three coat process. First of course spraying a high bonding primer, such as XIM, letting dry overnight. Followed by two coats of either paints suggested above, allowing those to dry overnight in between coats. I know you want your kitchen back, but not getting in a hurry, allowing the paint coat to dry properly is key. And guess what? You're able to paint over laminate kitchen cabinets as well using this methodology. Best of luck with your next kitchen cabinet painting job, knowing we have just scratched the surface (no pun intended). There is a tremendous amount of work besides any siding you might have to do, cleaning, priming, and spraying top coats of finish products. This work involves masking. 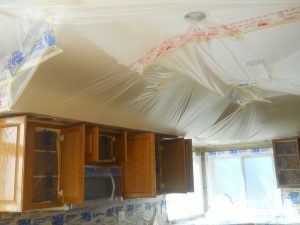 Masking off everything you wish not to be painted in your kitchen, which includes ceilings, walls, back splashes, sinks, hardware, appliances, floors, and counter-tops. 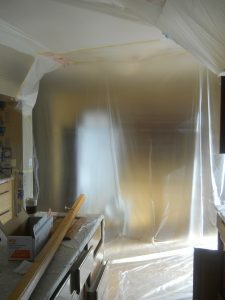 We essentially make a spray booth in the kitchen, and has limited use for the duration of the painting procedure. Cutting a slit, or making a flap for an entry during this process. Your still able to access the refrigerator, but forget using the dishwasher, and range. Spray painting your kitchen cabinets is indeed the best, most professional way to go. 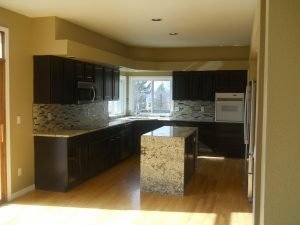 Hiring professional painters is your best option, having the experience, and expertise pulling this off, giving new life to cabinets once again. years of gratification, as others will too, who come to visit, knowing the kitchen is the life-blood of a home. Kitchens are where families spend the majority of the time, conversing, planning, cooking, and of course eating nearby. So it is essential that your kitchen cabinet painting is one that will last a lifetime, looking brand new ten years later, as the day they were painted. Understanding the best paint for kitchen cabinets is crucial, just as the following steps, tips, and knowledge is just as important. We all know cabinets are not painted everyday, nor usually more than once during the life of a kitchen or bathroom cabinet. Therefore, getting the best paint for your cabinets is essential. Interior house paint has come full circle with the technology, additives, and properties, incorporating oil or Alkyd paints with water-based Acrylic paints for water cleanup. What you want to make sure is your buying a paint, having the hardest enamel coating once cured. Have you ever painted a pantry shelf, putting a can of soup or Green Giant Green Beans back on it weeks later, and the can still sticks? Well, that wasn't the correct type of paint, and neither would be for kitchen cabinets. This brings up the topic of paint sheen, with Semi-gloss or Gloss paint finish being the hardest, most durable. Having one that allows you to wipe with a damp cloth is extremely important, cleaning spills, splatters, cake mixes, and waffle mixtures days later. I don't know about you, but I generally clean as I go, but some may wait, or get distracted, doing something else. Waffle mixtures dry very hard, and having a paint harder than that, will make your life much easier. You know where I'm going with this don't you? Not wanting to say, ''Rats! My paint is coming off with my dried waffle batter!''. Keep reading, as these suggestions below will ensure lasting beauty and years of enjoyment. 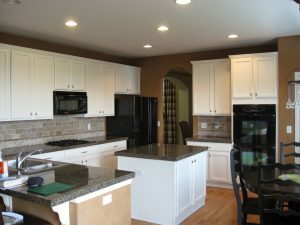 Cabinet paints recommended below, ensures a quality kitchen cabinet painting job from the get-go. Having many years of durability, proper adhesion and leveling will look like those cabinets were painted in the factory, having a hard car finish, and not some fly-by-night painting job. We have painted many kitchen and bathroom cabinets over the years for our clientele, and not one warranty question speaks highly. ProClassic® Interior Waterbased Acrylic-Alkyd Enamel is a tough and durable coating that enhances the look of doors, trim, cabinets and furniture. Excellent adhesion, flow, and leveling, non-yellowing and a unique wet and dry hide makes ProClassic® a perfect choice. The paints to use on unfinished cabinets are the same ones to use on finished ones, however proper steps mentioned below is vital for a professional paint finish. Unfinished kitchen cabinets are typically rare. Even the natural ones have a non-noticeable protection to the unfinished wood. Having a sealer, lacquer with a matte finish makes the appearance almost unbeknown. So unless you are sure you have unfinished cabinets, you may want to take a closer look. This is important either way, in that you will want to use a high bonding primer when you are ready to start painting. Fresh new cut wood needs to be sanded first, removing tiny fragments of wood particulates. Carefully sanding with the grain, as if you sand against or across the grain, will leave scratches, making the paint level even more than it has to. Paint is not smart, and only goes on a substrate that is clean, and sound. Wanting a smooth substrate is key, as well as cleaning, dusting, having no foreign matter under the coatings. We generally use lacquer thinner on a rag, with proper safety procedures and ventilation, wiping down, cleaning every square inch of paint surfaces first. Once dried, lacquer thinners allows the primers (latex or oil) to penetrate, bonding to the surface, than any thing else on the shelf at your local department store. Painting kitchen or bathroom cabinets without sanding has been available since the mid-90's with a special bonding primer. Allowing you to paint over stain & lacquered finishes, without having to sand or scuff the surface. Those cabinets having a deep marine varnish look, our technology in primers allows no sanding or scuffing surfaces. 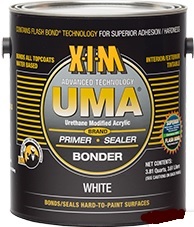 Applying a high bonding primer allows the Acrylic-Alkyd paints to adhere and grip that primer far better than not using it at all. Have you ever accidentally or on purpose scratched latex paint off of glass, Formica, tub, or laboratory? It came off very easily didn't it? Well, it wouldn't have if it were primed first. Same way it goes for cabinetry. You do not what your paint to scratch off do you? Then use a high bonding primer first, letting it dry overnight. Not wanting to get in a hurry at this point, as these steps are critical for your paint to last and last, and sanding was not part of the equation. Hope you've enjoyed reading this material, and best of luck with your next cabinet painting job. 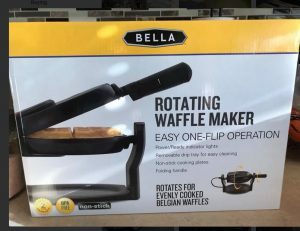 Never have to worry about waffle batter ever again, no matter how much you sling the batter! Like to hear from you with any comments below, and if you're in the Denver, CO. area, needing the top painting contractor, having over 40 years experience, Give Us a Call! How To Paint Kitchen Cabinets - No Sanding - Eco Paint, Inc.
Best Paint for Kitchen Cabinets - White - Eco Paint, Inc.
Modern - Painting Kitchen Cabinets Black - Eco Paint, Inc.